The highlight of last season was the arrival of a swallowtail caterpillar. I’m glad he was a pretty one and not one of the ones that look like snakes (creepy!). I had several volunteer (did not plant) dill plants last year. It’s not one of my favorite herbs (although the best pho I’ve ever had had dill in it), but it does a lot of good in the garden as a companion plant, attracting beneficial insects and discouraging harmful ones. I purposely planted one this year in hopes of attracting the caterpillar, but no luck yet. Sadly it hasn’t done much to discourage cabbage worms. A discouraging sight on my collard greens. Had to pull them and my kale. There was a new pest in the garden last year: mealy bugs. I’ve encountered them before. They decimated my succulents at work. But this was the first time I’d seen them in the garden. I got to see them up close. You can see his snout much clearer here. I could feel him sucking in the air across my palm! The dill were covered so I just pulled them. By then the swallowtail was nowhere to be seen. I’d like to think he became a butterfly rather than a bird’s meal. Someone told me if I left a stick near the dill, it would pupate there. I’ve also heard it could have pupated on the side of my raised bed. Wish I’d seen that. I did see the caterpillar in the instar stage so it would have been cool to see the full cycle. In addition to the mealy bugs, I was sad to find a cabbage worm on my dill. Once I checked the life cycle to ensure it wasn’t a swallowtail caterpillar, it went right in the trash. Cabbage worm, with evidence of mealy bug cottony webs. Even when I thought I was bringing some nice dill in to work for a colleague, it turned out to be infested with aphids. Trashed again. Not a nice gift after all! Despite not really being able to use a lot of the dill last year. I think it’s worth growing it for the beneficial predators it attracts and the beautiful swallowtail caterpillar. 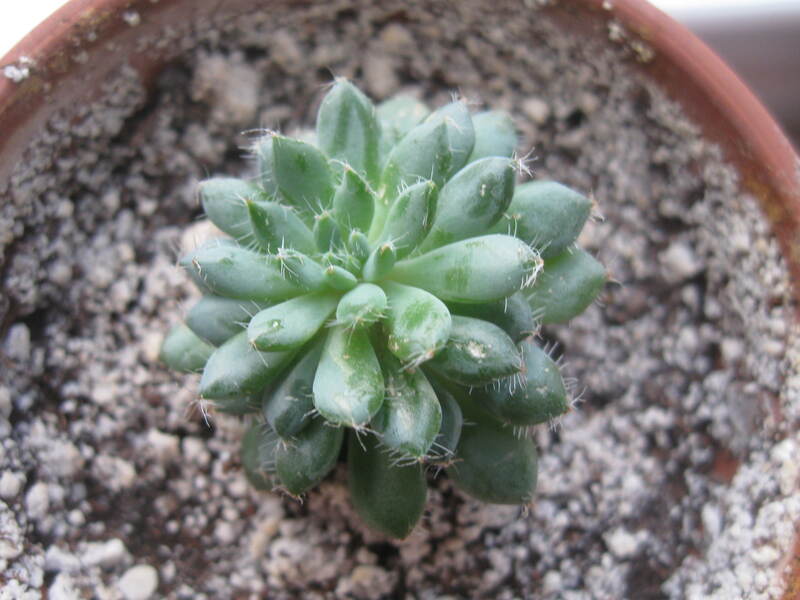 2015 was the year I really got into succulents. 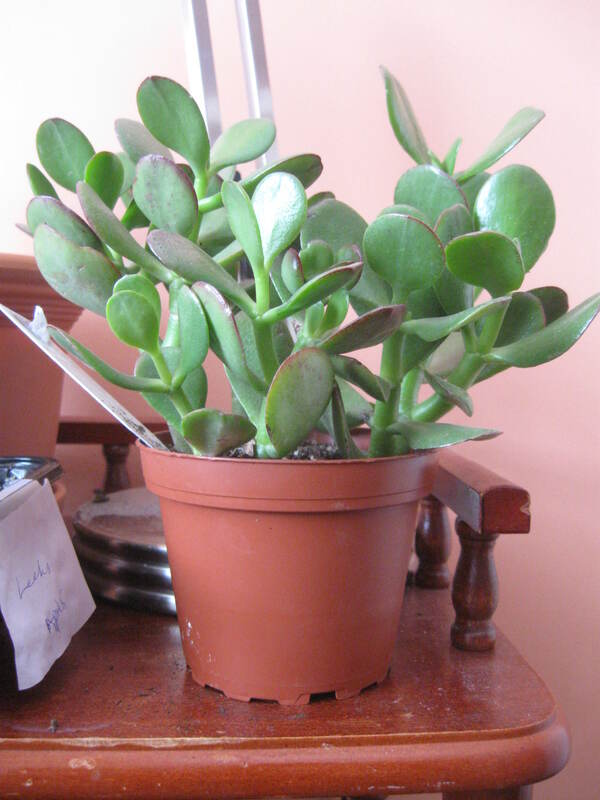 In early May I bought a jade plant from a store on Kingston Road near Victoria Park. I think my sister and I were visiting Threads Lifestyle, which like the the Keen store next door, closed in 2015. We decided to walk home and ended up ducking into a few flower shops on the way. In one shop I was captivated by the lithops or living stones, but I decided against purchasing the $10 plant (it needs lots of light and I don’t really get that at my place). I picked up this lovely jade instead. 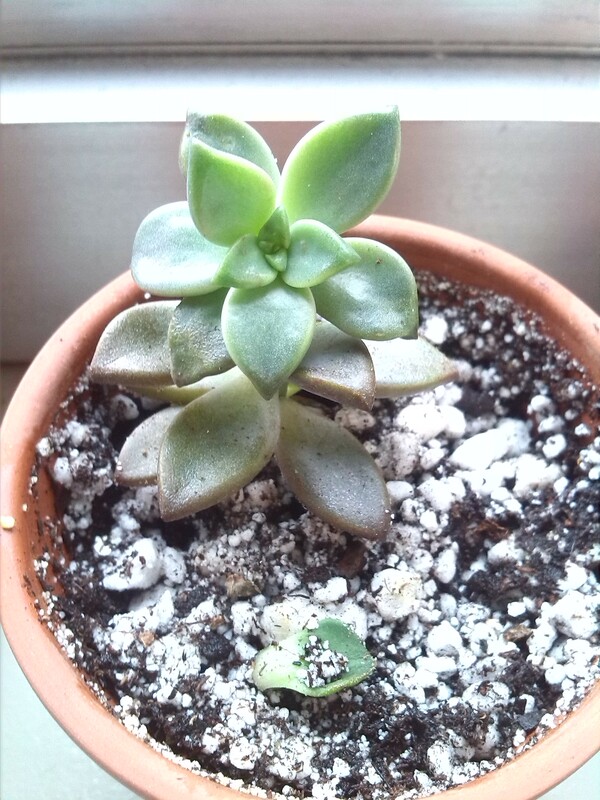 Sad state of affairs – whether it was over-watering or not enough light (or both), they all died. Early July. Luckily the one I gave to my dad was still doing well when I checked on it last summer (he gets a lot more light than I do). I briefly toyed with asking if he still wanted it but then stopped myself. Aside from it being very poor form (even though I don’t think he cared one way or another if he had it), how would I keep it alive when all the others I had died? Even though I failed at this attempt, or perhaps because of it, I became obsessed with the need to purchase more succulents. I searched the net for nearby stores and came across a review for Grow Something on Yelp. The reviews, though few, were glowing. The website only made me more excited. It was in East York according to the map, close to a friend who was on mat leave with her first child so I asked if she wanted to check it out with me. The store turned out to be in the backyard of the owner’s childhood home. The selection was great, the prices affordable, and the owner and her family were friendly and helpful. We each ended up buying a tray of 6 with the intention of sharing once they made ‘babies’. Over-watering probably got this one. Top left in the tray above. Looks like mould. Could it be mealy bugs? Original plant is bottom left in the tray above. 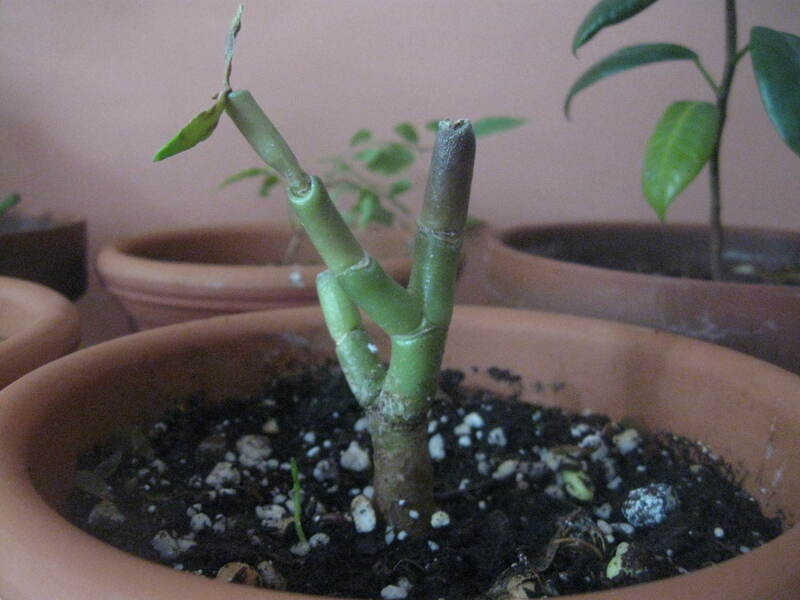 If you rest a leaf on top of the soil, eventually a new plant will begin to grow. Original plant top right corner of tray above. I’m not sure why some plants didn’t survive. Perhaps I over watered initially (I think I was doing it once a week) or maybe it also has something to do with the environment in my office. They are right in front of a north west facing window (there is a building next door which blocks out some light) but behind them is a vent that I can’t really control. Perhaps my potting soil to perlite ratio is also off (it’s about 50-50). Who knows. Failure again did not deter me. I took another chance when my friend decided she wanted to go back for more plants (she was hooked!). I got 6 more, including an airplant! 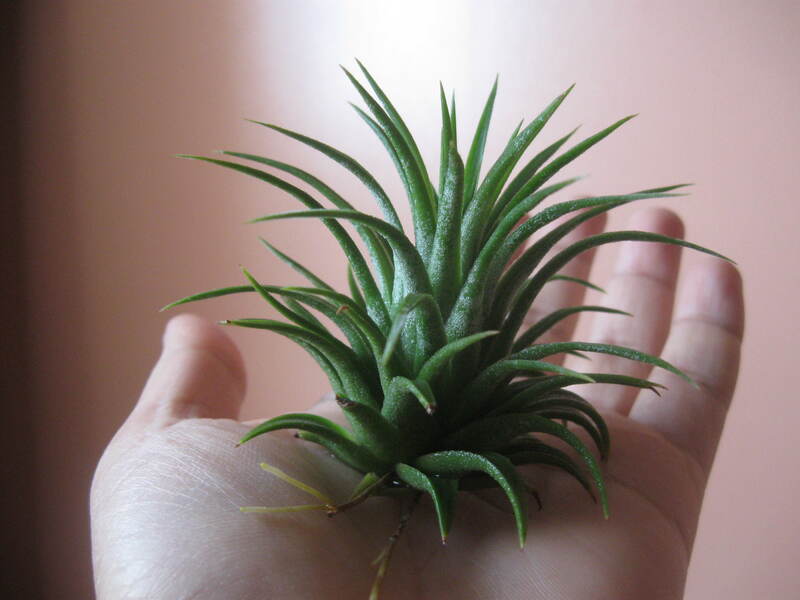 Tillandsia, or air plant. Care tips. 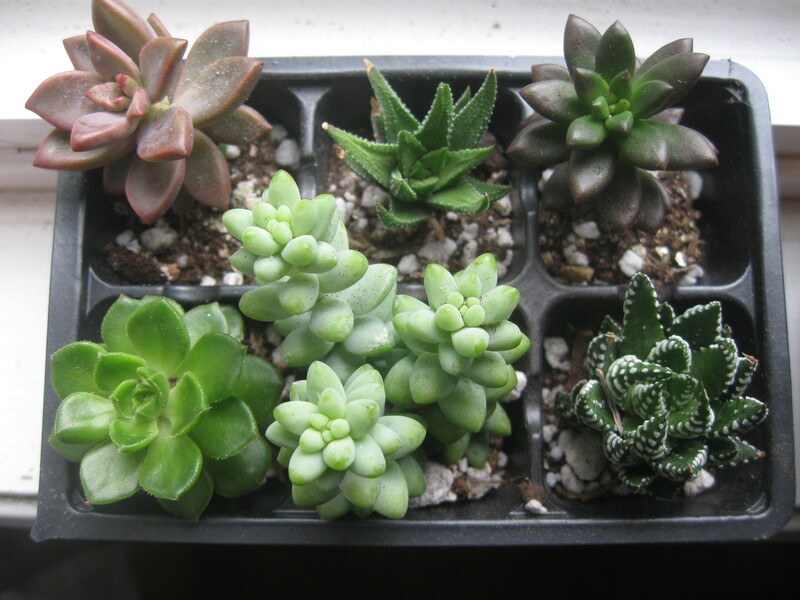 I put them all on the west facing windowsill in my bedroom. They were doing really well until I moved them into my living room, which gets much less light, when it started to get cold. 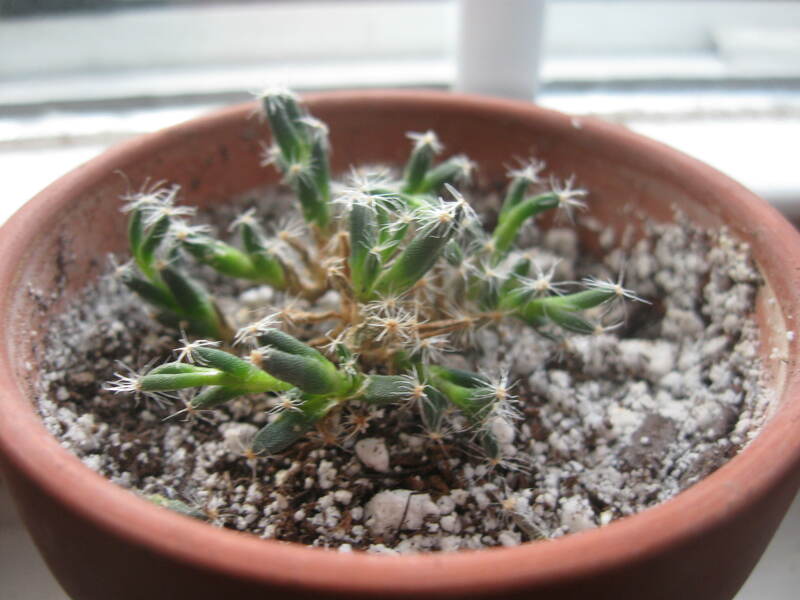 One day I noticed my favorite cactus had mealy bugs! Mealy bugs on my favorite succulent! Late November. I used the direct dab with alcohol swab method of dealing with this pest. I couldn’t find definitive guidance on how often to do this so I just did it once a week on all the plants that looked like they had mealy bugs. I also wasn’t sure of how long to leave an insecticidal soap on a plant so I didn’t choose that option, although it was mentioned as a really reliable option on many Facebook gardening groups that I follow. 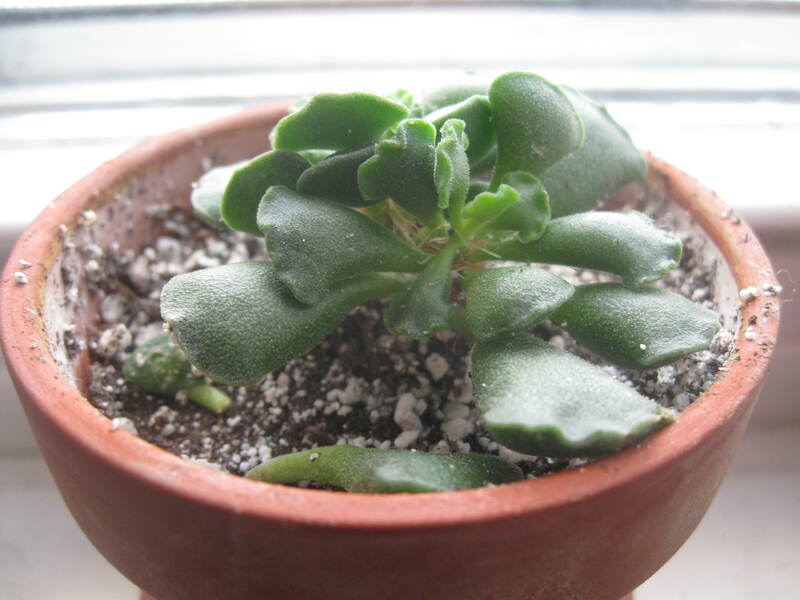 I think the recommendation to test whatever you plan to use on a small part of your plant before you use it on the entire plant is a really good idea, but this is hard to do on really small plants like this. This plant doesn’t look as good as when I bought it (the brown parts). I wonder if it had to do with the alcohol applications or poor light exposure. Mealy bugs are apparently attracted to fresh young growing leaves which this one had plenty of during the unseasonably warm fall weather. This plant was more full when I bought it. The bottom row of leaves shriveled up and died. Low light or alcohol applications or both? Some of the leaves near the top have a bit of damage. This one doesn’t look so bad. 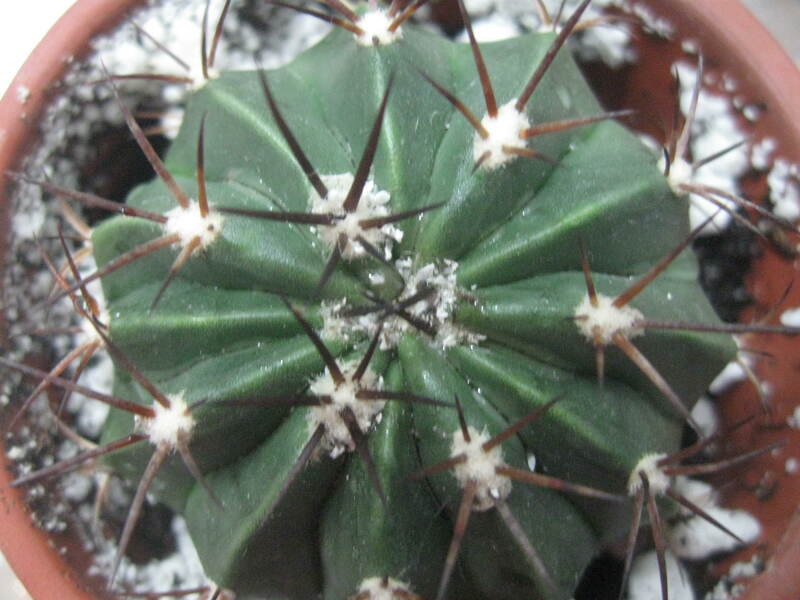 I’m pretty sure the minute white spots are perlite dust and not bugs. I have some leaves resting on the soil to make more plants. Perhaps I should move them to their own pot. 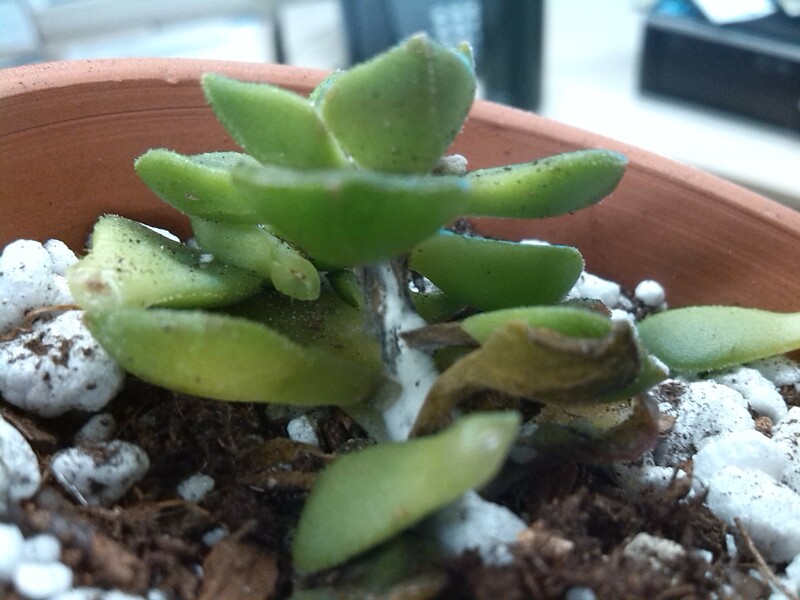 It’s easiest to get the mealy bugs off of the jade. Not many places to hide. 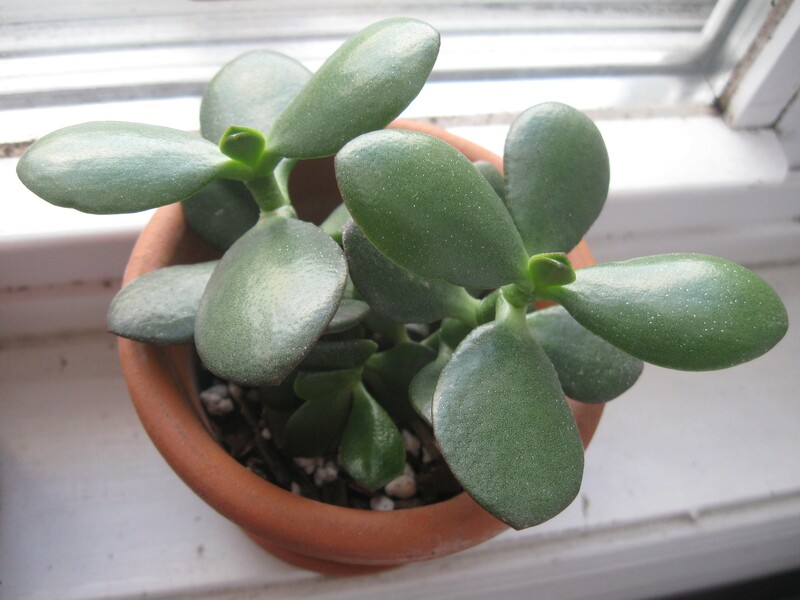 This jade is doing really well on the windowsill and seems to not have been greatly affected by it’s time in the low light of my living room. I’m glad I persevered with the succulents. They’ve given me a lot of joy. I’m looking forward to getting more plants when the store reopens in the spring. 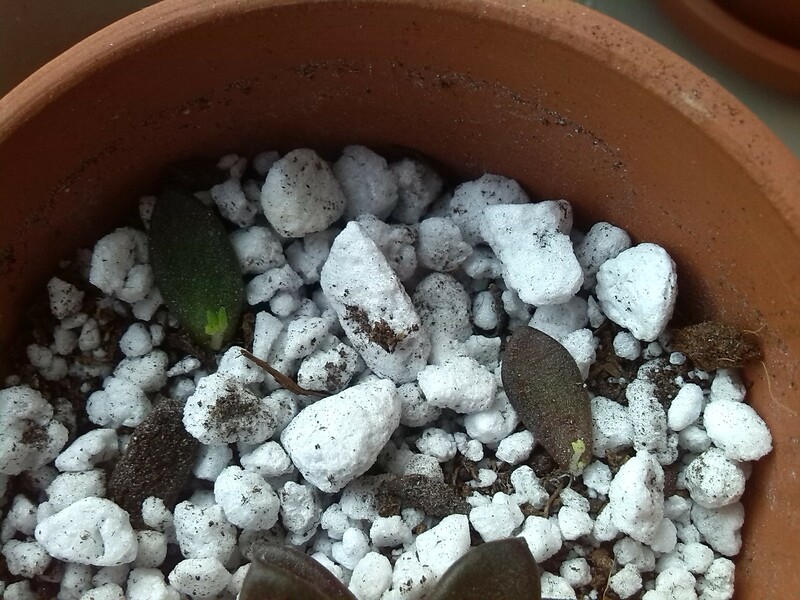 I may take a chance on the lithops this time, knowing that my bedroom windowsill gets a good deal of light and I’ve had some experience with caring for succulents and dealing with pests.